This article is about the character. For the mission by the same name, see The Dreaded Octonozzle!. The Dreaded Octonozzle is a one of the Great Octoweapons found in Octo Valley. The Octonozzle was an Octoweapon created during The Great Turf War by the Octarian army. When everything looked victorious for the Octarians, a plug was pulled and caused the Octonozzle and the rest of the Octo Weapons to shut down. Nearly 100 years later the Octonozzle was powered up again by a Zapfish in order to strike once again. The Octonozzle is a can-shaped machine covered in Seaweed. It has two eyes that resemble real Octopus eyes and a pipe in which Ink can be shot out. It also has a pair of robotic feet that are similar to Octopod feet. Around its "waist" are several holes that suction-cups can pop out of to keep the machine's body up. Phase 1 of the Dreaded Octonozzle. 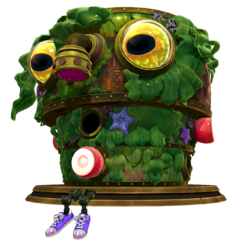 In the events of the first game, The Octonozzle is awakened when Agent 3 arrives to its Kettle in Sector 2. It will then attack by shooting balls of ink from its "nose" until Agent 3 pops all the suction cups to reveal the weak point. It will then lift its body up one in order to make it more difficult for 3 to pop the targets. After splatting the tentacle three times, Octonozzle will be defeated and then explodes. In the first trailer for Octo Valley, there are three Octarians seen that have a small resemblance to the Octonozzle. It is unknown whether or not they had a similar attack pattern. Concept art of the Octonozzle. Agent 3 battling several Octarians alongside the Octonozzle. This page was last edited on 13 February 2019, at 01:24.